Yep, that's my goal. I'm shooting to weigh 150 lbs by my 50th birthday on May 18. I laugh when I think back to how upset I was about being a fluffy 150. If I'd only known then what I know now! I'm rambling. Back to my point. 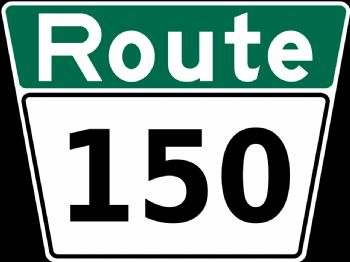 So, I've set my sights on a HEALTHY 150 as my goal to start the second half of my life full of promise. I have been thinking of numbers quite a bit with my goal-setting. In my quiet time this morning, I read about Noah building and launching the ark (Gen. 7). He was 600 years old when the floods happened. How in the world could I last another 50 years on this earth and maintain a healthy weight? I am such a yo-yo---either gaining or losing, never m-a-i-n-t-a-i-n-i-n-g.
Then I saw the next number--150 days. Yes, it rained for 40 days/nights, but it said the floods took over for 150 days. That's about 5 months. I've got about 5 months to reach my new goal. One discipline at a time. Small, repeated deposits over time. 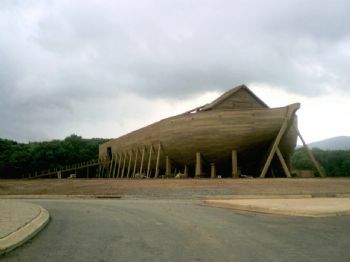 That's how the ark was built--one gopher-wood plank at a time. That's how the rain receded into the earth--one drop at a time. Every time I say, "No" to a cookie--cha-ching/deposit. Every time I lift my knees to stretch, pose, hold, repeat--cha-ching/deposit. It is about time and small choices over and over again. My future health and promise of making a difference with this earthly body to impact my world depends on the daily hammering away. Steadfast discipline. One nail at a time. It is time to build an ark. I like the way you think. It is a one step/one decision at a time journey. It sounds like you have a good plan for getting where you want to be. You go girl!!! I'm with you in this but I'm a turtle when it comes to weight loss so I'll be behind you. LOL Great Job!